It’s never fun when garage door springs give out on you. Dealing with garage door springs that are failing is dangerous and something that should be done by professionals. Call F&J’s 24 Hour Garage Door Service when you find yourself in this situation. We will be able to handle the mishap safely and efficiently. Our years of experience with many different kinds of springs make us experts in our field. We have experience fixing many common types of garage door springs. Properly identifying your springs will make our job go much more quickly, but this is not a requirement. Here are a few different garage door springs that are commonly found on garage doors to help you identify yours. 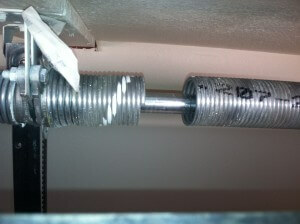 The standard garage door torsion spring is one of the most common types of springs for residential dwellings. They are often mounted above the garage door opening and are supported by a single shaft down the middle. If your garage door is light, you will most likely only have one, but you may have two if your door is heavier. The early set spring is another common type of garage door spring. They are akin to the standard spring, but they are in the center of the shaft instead of towards the opening. Also, they have different hardware that is used to install them. A steel rolling door spring is another common type of spring. However, these will most likely be found on commercial buildings and have the spring encased in a barrel that will support the door. Another commercial spring that is commonly found on storage units is the one-piece curtain spring with two springs on either side of the rod that support the weight of the door. There are three main things that happen to garage doors. Something might shift out of place, which means that a garage door spring adjustment is needed. This is fairly easy and quick to fix. Sometimes, small things break or stop working in garage doors. Usually, these can be easily fixed with a garage door spring repair. Lastly, if your garage door spring has ceased to function, a garage door spring replacement might be needed. This will happen if adjustments and repairs do nothing to the spring to make it function again. We will provide you the best service on your garage door spring repair service. You will be able to sleep easier knowing that your garage door is working properly.